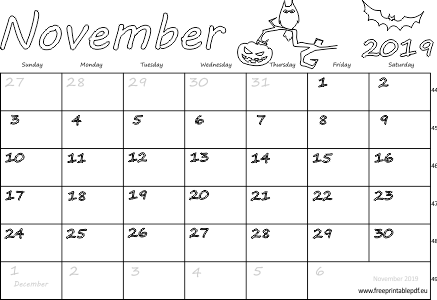 Two versions of November 2019 calendar for printing and coloring. One calendar is blank, the Canada version is second. All November calendars with week numbers. Theme: pumpkin, bat and owl. Just download, print and enjoy! May be used as monthly planners for Canadians.